I'm captivated by these orange chairs. Sigh. Unfortunately I can't think of how to work one into our mustard / moss green living room. A pity. Somebody else, go get one and I will come to visit you often. Ah yes, but there would be room if you removed one of the grey chairs and replaced it with an orange one! you could always make an orange slipcover with your awesome orange fabric :) or add orange pillows, but that probably wouldn't cure the orange craving. Well even without the orange chair, I love your living room! 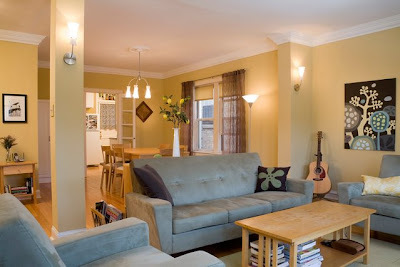 So nicely decorated and the style I would want if I knew how to decorate! I love your living room. But I think I'll be purchasing the CB2 for my soon to be orange accented living room. THANKS! Wow. I absolutely love your living room. Come over to my house (and bring your amazing sense of interior design) and I'll let you decorate my living room with an orange palette. I think you could! Put a little orange tidbits here and there and then add the orange chair somewhere...do you have room in a corner? I think it would fit nicely! Sara, I was thinking the exact sam thing. 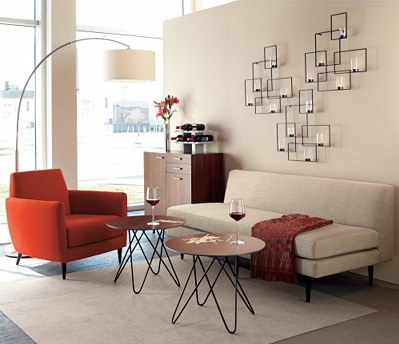 I really love the Boden Chair and I want the paper clip side tables in the CB2 picture. How is it that Y.O.U don't have orange stuff in every nook and cranny of your home? put one in your guestroom! I have a brown and robin egg bluish office...my favorite thing? A TANGERINE CHAIR! Throw it in for some zing...you will love it! Actually, I think an orange chair in the living room would POP! If you try, I know you can work it in. By the way, I love your blog. It inspires me. For example, my daughter's crib bedding: hot pink and orange. Her brother's bedding: turquoise and orange. Also, we recently got 2 orange chairs. We were going to recover them, but once we got them in the living room, they looked so great that we left them orange. I love them. I think you would too. Thanks for sharing the things you love. Sorry, there's no room for one here, either! It really would NOT go with the green rug. Ew. Would look hideous, even. But I got distracted on the Room & Board website, and I want the Cameron sofa now. *sigh* Alas, I don't have $1400. Booooo! C'mon, there's ALWAYS room for an orange chair. Orange is the new black (brown, pink, whatever the IT color is these days). It's like it shouldn't match everything else, because its matchy-ness would muffle its brilliance. :) Love your cute room nonetheless! Are you kidding me? All the blogs I read about decorating tell you to have what you like in your house.....go for orange...who cares? You arn't trying to impress the Queen, and even if she did come, she wouldn't care. DO IT! What?! It's the perfect accent color in your room. Seriously. I bet you could fit an orange chair in there...i think it would be a great pop of color and you can always tie it in with all sorts of cute orange projects! Ooh, orange would look great in your room. Of course you can use an orange chair with mustard and green. It will be a pop of color as they say in the dec. business. go for it. Life is too short to go wothout. a lady after my own heart!!!!!...... I love orange... any shade will do especially brunt orange!!!! I think an orange chair would look fabulous in your living room. It would be a great "pop" of color. Orange pops would look fantastic in your room! Your room looks pretty neutral. An orange chair would be a nice pop. Nice place! And very tidy!I would be happy with what you have and create an orange throw with pillows to get your orange into the room! On the contrary ~ I think an orange chair is just what your living room needs! Oh my how lovely... what color paint did you use on your walls? I can see how the orange chair might not work in that room.... I bet it would work in a bed room or office. your living room looks like a picture out of a catalog. just beautiful! 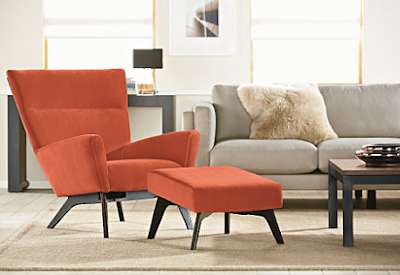 you COULD put one of the gray chairs in another room and replace it w/ one of the orange. it's totally doable. I disagree re: no room for orange chairs with your current colors. :) I agree with some of the other comment: you should get rid of an existing piece of furniture & add one of the orange chairs! Do it! So I'm looking at your furniture...You need some orange to pop! How about some nice throw pillows. That would go so nicely with your couch. Your living room is beautiful! Calm and cozy. An orange chair would be beautiful too - but would just require some rearranging. Show us if you decide to add the orange chair! Time to re-vamp and re-paint. I love that first Boden chair! It would so pop against your blue/grey sofa...as for the paint, if I really want an item that won't fit, I say RE-PAINT! How about some large floor pillows in a fabulous tangerine color! i just oohed at the tangerine chair at CB2 today though the Boden chair is pretty snazzy! ps. just found your blog. I love orange. We found a rockin' orange chair @ Habitat from the 50's - I know what you mean - it's just fun to have a splash of orange!! Guess what?!? Apartment Therapy is running a contest for the orange Boden chair! Go sign up!! Wow, cool! I entered. I'm certain I will win it. Not.